Wikipedia is an online encyclopedia. Built up by thousands of contributors and its tenets being safe-guarded by more than a thousand administrators. Its essence is to provide a compendium of reliable information, centered with a goal to be a one-stop site from obtaining information about a notable subject on a summarized manner backed by references from external sites. The keyword is "notable". Although the community has provided an ever-developing tenets and policies to remain a resource of such quality; how does the continuous goal to the gratification of notability and verifiability costs it in expense of proliferation of facts and ideals of a community. Last October, I was invited as part of OpenStreetMap Philippines to join in with WikiMedia Philippines on their wiki expedition of Sariaya in the province of Quezon. OpenStreetMap and Wikimedia are similar in a sense that both organizations believe in the value of free data although they differ in a sense that Wikimedia is for content while OpenStreetMaps is for maps. Wikipedia, on the other hand is hosted by the Wikimedia Foundation as a free-content internet encyclopedia. The Wiki-Expedition in Sariaya aims to preserve heritage sites by ensuring that data about these sites remain in the internet to preserve and protect Filipino culture. By making sure information about them (in pictures and in written articles), they may be remembered in spite of decay or destruction due to ineptitude of the government. Thus the roots of Filipinos remain in the knowledge base. I am more of a mapping advocate than a Wikipedian but upon learning the objectives of WikiMedia Philippines, it might be worthwhile to try it. 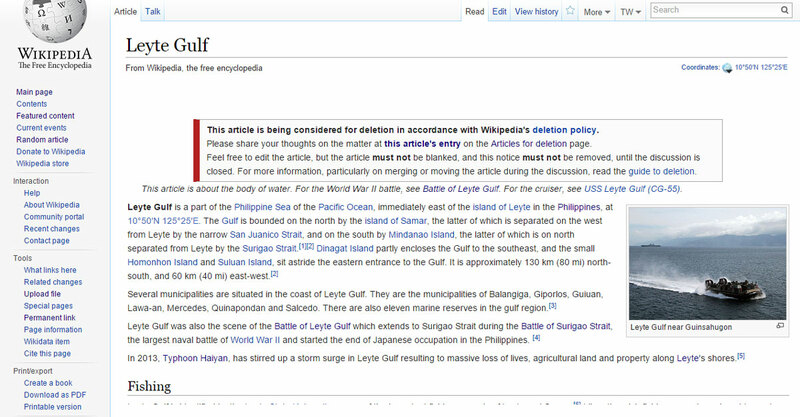 Prior to the Wiki-Expedition of October 2014, I have already tried to contribute an article in Wikipedia. Back in November 2013, one of my first attempts was to add information in the article about Typhoon Haiyan (Yolanda) upon seeing that a record-breaking and momentous event about contributed mapping in Openstreetmap is taking place for the Philippines and this contributed mapping activity results to mapping data updated in realtime which can be used by unfamiliar humanitarian missionaries to use it in rescue and relief operations. 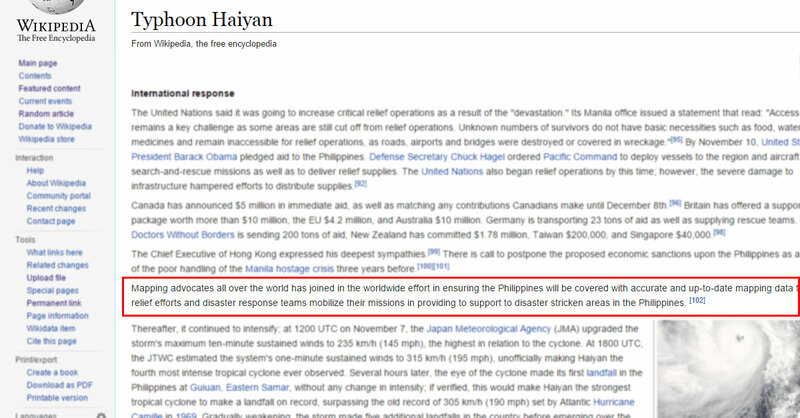 Being a newbie in Wikipedia, my early contribution was a paragraph about the humanitarian activation. Minutes later, as I try to verify my contribution, it is no longer there. Thinking it was a glitch, I re-wrote the whole paragraph again and resubmitted it. After a few minutes, it was gone again. I was actually perplexed, but then I discovered that the editing history of an article is available in the wiki and so I checked it and from there I saw a contributor deleting my edits due to the reason that no reference was cited. As the only reference during that time was the article I made about the activation, I resubmitted the paragraph with a citation using my article in Schadow1 Expeditions. In no time, it was removed again with a reason posted that it was deleted with a comment "do not use blogs". After which I can no longer edit as a temporary restriction was placed in the article and I can no longer edit it. I have not edited in Wikipedia for over a year back then. It was a bitter first impression for a new editor who gave a few of his minutes in contributing in good-faith to the resource. But joining the Sariaya WikiExpedition and its advocacy enlightened my hopes for the Wikipedia community. It is possible that my initial experience is only an isolated case; and the cause of the organization outweighs the experience. Knowing that this Schadow1 Expeditions site would not live forever and Wikipedia would eventually out-live this site, in line with my site's battle-cry where "A Filipino must not be a stranger to his own motherland", I decided to contribute some of my expedition-acquired knowledge in Wikipedia's article space and some photos in Commons. The first contributing experience with Wikipedia is off and so I read a few policies before editing back in Wikipedia so as to respect its existing norms. I started reading up its definition of "reliable source" where I first fell as a victim, and other policies that give exemptions to it to give way to acceptance of factual data to remain. In the course of time, I have also learned about their Conflict of Interest policy where it discourages people with connections to the subject to edit the article but does give exemptions to give importance to facts. Learning about this and having contributed to Wikipedia mostly with information coming from my own expeditions which is published in this site using it as reference, I have started to create my user profile page with full disclosure hoping that this would appease in the future in case someone else would question the edits. In the long run, all of my and other contributors' edits in Wikipedia bearing this site as the source was deleted by two to four contributors by cranking up Schadow1 Expeditions as a "non-reliable" source as per their consensus. Even one of the contributors instigating OpenStreetMap data related to the article was considered as spam as it bears "Schadow1" as the contributor and was removed in several articles. So what does this indicate for the Wikipedia community? The Wikipedia community has two opposing philosophies: Inclusionism and Deletionism. Although both philosophies provide important roles in assuring that only important and verifiable information are retained in Wikipedia, as any belief, extremism can destroy the article quality. Over inclusionism results to a fairy tale type of article, making it a mockery of being an encyclopedia. Over deletionism would give a censored Wikipedia, leaving the articles to lack detail and discourages editors from contributing to the articles when most of their contributions are questioned or deleted. For a subject to be allowed in Wikipedia, the subject (whether a person, an event, an object,or any existence or idea) must satisfy its notability guidelines. And any data included in the article must be verifiable by adding reliable sources as references. Reliable sources according the policies are those from the media. In the Philippines, media exposures tend be those that appeal to popular culture. And this is the reason why most of the coverage in Wikipedia in the Philippines that easily gets created are those who are in show business. Being adept in advertising due to the nature of my job, I also know some media outfits that are being paid to offer or deny exposure, or sensationalize or de-sensationalize a subject to give advantage to the payee. Its strict implementation of "reliable sources" would eventually be an extension of some of the inefficiencies of paid (under the table) information in [some] media coverage. I even had an experience in Wikipedia with a regular contributor who deleted citations in Mt. Marami that is pointing to my article regarding our first mapping expedition across the mountain range to where it belongs to. 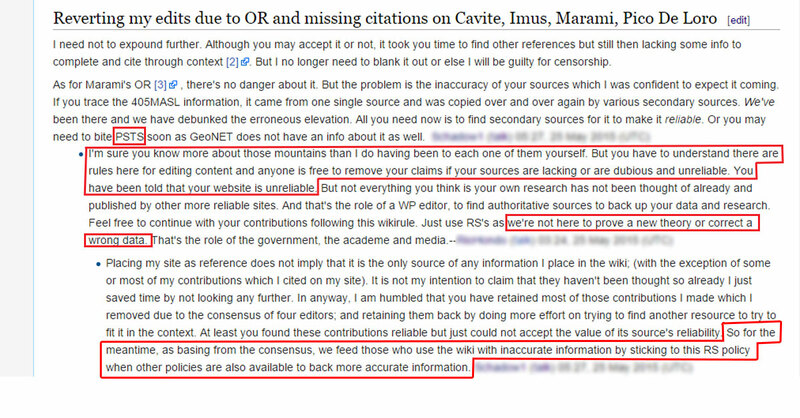 To try and test the waters, I have answered back by deleting some contents of the article that I contributed to it that was left out standing without any references; specifically the elevation of Marami which our expeditions obtained using tools such as a properly calibrated GPS, which is 633 MASL. He brought back the data by placing in 405MASL which is an old inaccurate data which is spread over the internet; even by those sites that are considered as "reliable sources" by its policy. After explaining to the contributor the inaccuracy of the data he pulled from and pointing him to contributed GPS tracks from our expedition, he remained his position to use 405MASL. This is an example of censorship and feeding the users of Wikipedia with unreliable data by blindly following the verifiability clause. 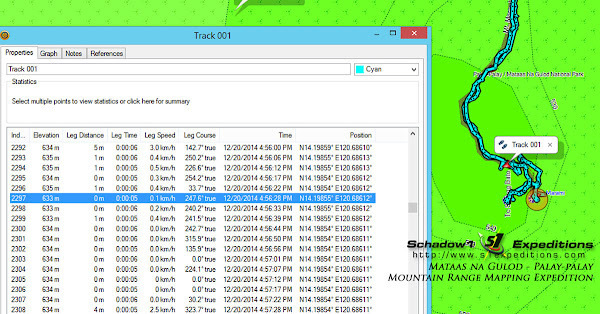 A talk with a contributor regarding retention of the real Mt. 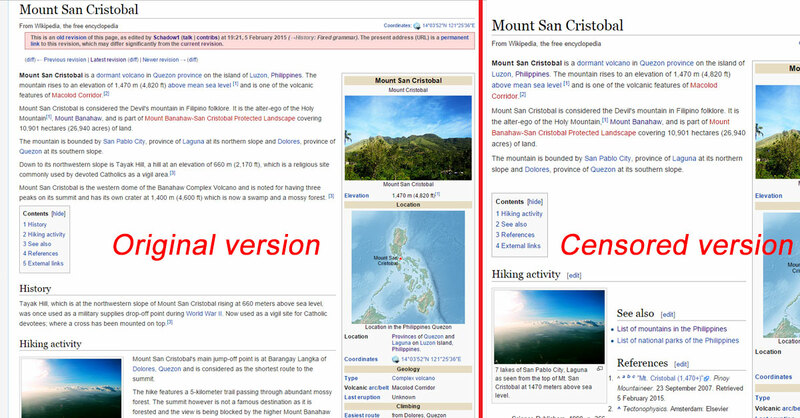 Marami's elevation using another Wikipedia policy that allows the use of regular websites as references; which ended in vain. Lost information due to censorship caused by deletionists. 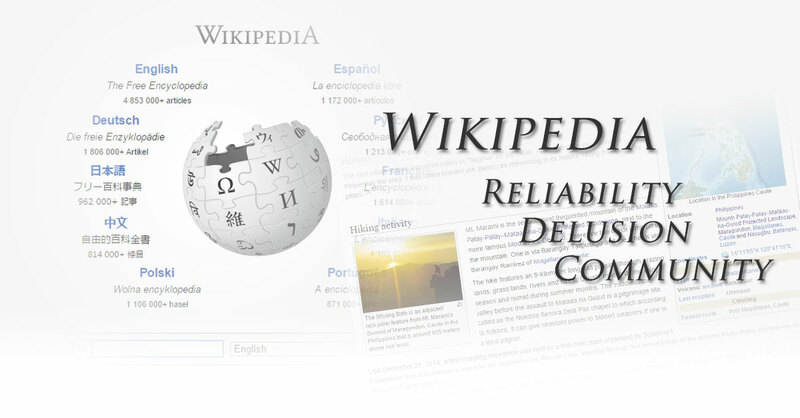 Although there are policies in Wikipedia that protects itself from extremism of deletionists such as allowing other sources that are considered facts, it is still the deletionists stance that outweighs the inclusionists. In social behavior, restrictionists such as those who are extremist deletionists in Wikipedia, gets their satisfaction through a sense of "authority" against another by deleting other contributions. Primarily, those who are of weaker disposition are those who are new contributors which usually are inclusionists as their first contribution is obviously to include information instead of deleting one. Usually they become the prey and usually gets discouraged. Community that bickers is not a "comm-unity"
Although discussions in Wikipedia provide a democratic way to handle editing disputes, the existence of opposing views leads to disunity so therefore there is a problem with the spirit of "community". 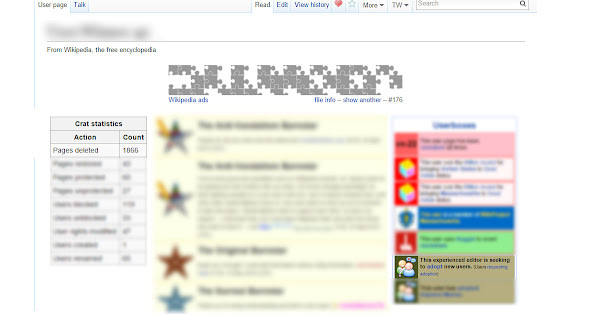 Although not written as one of its policies, behind the lines, Wikipedia promotes anonymity of its registered contributors. Originally, in good faith, this is to protect a person's privacy; however this "status quo" gives "keyboard warriors" the capability to be their predatory selves. This results in having them an upper hand in harassment attacks against those who allow themselves to be known. Being known hampers abusive deletionists and inclusionists in doing their "destructive" edits; and being more humane results to being a "community". 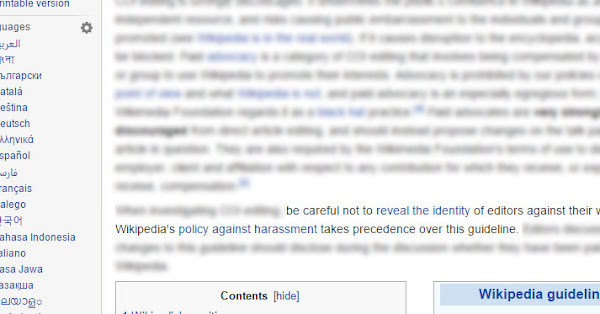 One of the guidelines in Wikipedia which has the clause about discouraging revealing of identity. Previous versions of Wikipedia's policy regarding conflict of interest allows editors related with the topic to contribute to the articles only if it maintains that other policies are followed such as the use of neutral point-of-view, factual and reliable sources. Eventually upon its latest version (as of the time of this writing), more stricter clauses have been made to discourage editors with conflict of interest. This policy is actually an example of hypocrisy as contributors usually contributes information in Wikipedia because of their "interest" in the subject. And with their interest in the subject, they are more knowledgeable about it; which gives an editorial advantage. The drawback however is bias, which can easily be remedied by other contributors with similar interest in the opposing belief. Proper declaration of interest by discouraging anonymity of contributors as well as respecting other policies will more likely be sufficient to remedy bias. Its decisions are based on consensus to where decisions are not based upon a majority but is based upon how an administrator decides upon something based on his understanding of the Wikipedia policies. As there are no firm rules in Wikipedia, an administrator can base his decision depending on which rules he wishes to use. Even as few as two contributors can change the course of articles in Wikipedia to either destroy it or create it. 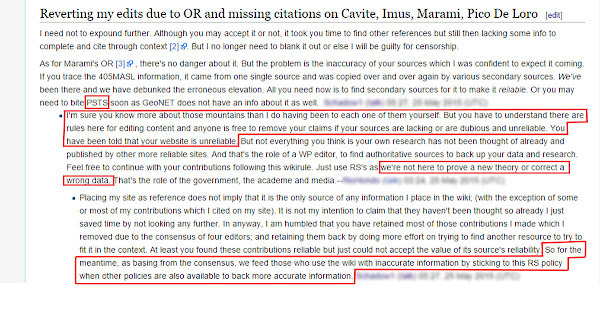 Below is an example of a discussion regarding the deletion of the Hinatuan Enchanted River which shows the negative effects of consensus and discouraging "conflict of interest editing". The Enchanted River was pushed to deletion simply because the deletionist contributor is unaware that it is called the "enchanted" river and thought that it was "promotional" in nature which is against the policies of Wikipedia. While "reliable" sources during that time were unavailable to prove its notability. Although in reality, to those who have "interest and knowledge" about the Enchanted River, it is actually called as one due to its "impressionist" natural colors. After a consensus, at least it was not deleted but was instead renamed to "Hinatuan River" which is still incorrect as the Hinatuan River and the Hinatuan Enchanted River are both different and unrelated body of water. This is an example of an inaccurate article which was brought by incorrect consensus, strict implementation of "reliable sources" and hypocritical conflict-of-interest rule, which could have even worsened if in case the article was deleted due to deletionists. Fortunately, this article was already corrected by Schadow1 Expeditions after 5 years of its inaccuracy and even resulted to be featured on Wikipedia's main page. 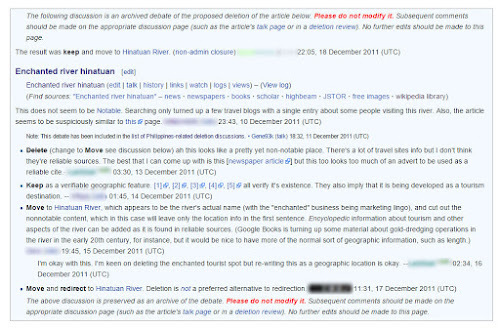 However, because of four contributors who made a consensus that deemed Schadow1 Expeditions as an "unreliable source", the reason why the article was featured on the main page has to be deleted as the information that it is a tidal estuary (which is a result of the research made during our 2015 East Philippine Seaboard Mapping expedition) was referenced to our feature on Hinatuan Enchanted River. One of the primary reasons why there is a very strict implementation of notability in paper encyclopedia is due to its limited medium of storing data. Wikipedia is an online encyclopedia with unlimited resources for data storage. 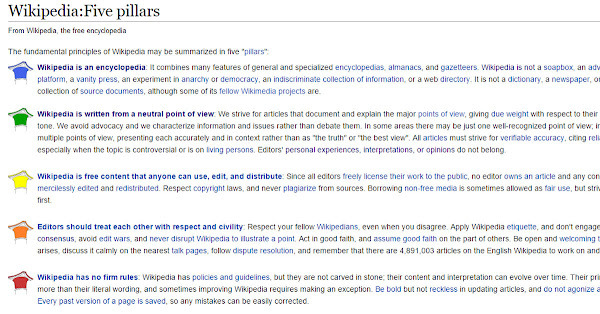 The "five pillars" of Wikipedia provides the best rationale to protect its community from degradation. Unfortunately, its last two rules, namely assuming good faith, and having no firm rules are the most underrated pillars of seasoned contributors - especially those who only "contributes" in Wikipedia to delete contributions. In conclusion with its imperfections with its community and some of its administrators embracing zealotry, Wikipedia is best to be called a neutral knowledge base of information; and not necessarily a complete nor a reliable source. Fortunately, Wikipedia is not a major travel and mapping resource site. Note: Wikipedia, itself, claims its website is not a reliable source. Wikipedia is a disappointment. Because of this, I always tell my students that if they submit their research assignments, make sure that the source is direct and not coming from Wikipedia. Very interesting blog that speaks of what is truly happening in Wikipedia. I am a regular Wikipedia contributor since 2014 focusing on expanding, standardizing and formatting the pitiful geography stubs of the Philippines. I agree Wikipedia has so many policies that even I am not aware of, although I also learned not to use any blog site and even be suspicious of mirror sites with exactly duplicate text. Indeed i salute your continued dedication in Wikimedia as well as in OSM (I am also a contributor).